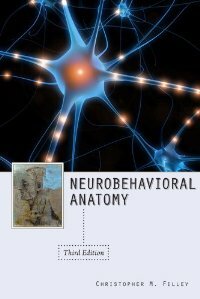 Thoroughly revised and updated to reflect key advances in behavioral neurology, Neurobehavioral Anatomy, Third Edition is a clinically based account of the neuroanatomy of human behavior centered on a consideration of behavioral dysfunction caused by disorders of the brain. A concise introduction to brain-behavior relationships that enhances patient care and assists medical students, the book also serves as a handy reference to researchers, neuroscientists, psychiatrists, and geriatricians. The book outlines how cognitive and emotional functions are represented and organized in the brain to produce the behaviors regarded as uniquely human. It reviews the effects of focal and diffuse brain lesions, and from this analysis a conception of the normal operations of the healthy brain emerges. Christopher M. Filley integrates data and material from different disciplines to create a concise and accessible synthesis that informs the clinical understanding of brain-behavior relationships. Clinically practical and theoretically stimulating, the book is an invaluable resource for those involved in the clinical care and study of people with neurobehavioral disorders. Including a useful glossary and extensive references guiding users to further research, the third edition will be of significance to medical students, residents, fellows, practicing physicians, and the general reader interested in neurology.